Eating out in Vancouver is still a major past time. With new restaurants opening up with what seems like daily, it’s hard to keep up. Not to mention always reaching for those digestive enzymes after eating at the latest organic white bread bistro is not always ideal. Leave it to the innovative people at Kitsilano’s own Rocky Mountain Flatbread Company to develop a new gluten free series of foods for those flour-challenged consumers. I was lucky enough to try a deluxe, four course meal completely gluten free (including Beer!) at RMF on the weekend. I’ll be honest, I was expecting to enjoy a nice meal out and probably utter the phrase “Yeah, it was good….for gluten free”. Little did I know I would totally forget that the foods I was about to consume were missing what I thought, was an integral ingredient, until now. I began with a bowl of their homemade chicken noodle soup. You don’t need to have a temperature or be fighting a flu to enjoy this warm hug in a bowl. The Gluten Free noodles add a nutty flavor that when paired with the house made pesto and Bradner Farm chicken, satisfies the soul without reinventing an ancient favorite. I then had the luxury of wolfing down their unparalleled gluten free pizza. With a secret combination of flours including chia flour, this delicately topped artisan flatbread will transcend your taste buds without doing a number on your digestion. Chia flour (which has all the nutritional value of Chia Seeds) is a better source of Omega-3 fatty acids than any other food grown on this planet. Not to mention it’s a great source of protein and fiber according to Nuchia Foods. The best part about the pizza is you truly do not feel like it’s lacking a thing. After my server explained to me that many patrons of the gluten free pizzas, often need reassurance that it is in fact gluten free because it’s so similar to the real thing. I believe it. But after this amazing meal, it’s easy to see why they are the experts in Gluten free. Following the thin crust pizza, the Chef came out a large bowl of pasta accompanied with local organic veggies and Organic Chicken. The thin fettuccini noodles were so full of flavor without the heavy aftermath. It’s such a treat to eat out and not be limited to one item on a menu or ordering an item with a million modifications. If you don’t feel like pizza, the daily pasta options are a great alternative. Then, just when we thought the Gluten free feast was nearing its end, they brought us out a Mango Cheese Cake with a flakey coconut crust. It was creamy, light and a perfect end to a family style spread. As Gluten free is becoming more and more necessary for people’s diets and of course the mere trend of it in Vancouver, it’s nice to see a local, family run restaurant provide a high caliber version without upsetting stomachs and wallets. If you’re in the Kitsilano area, you must make it to Rocky Mountain Flatbread to try these new and improved soulful favourites. 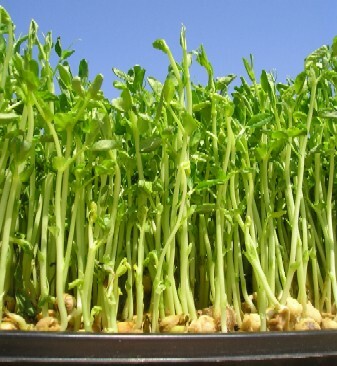 Pea shoots are packed full of vitamin A, C and folic acid. They are easy to super easy & fast to grow & are delicious to top salads, sandwiches & pastas with. And they can be grown indoors or outdoors! I have a tray in our kitchen and have found our kids just graze on them for a snack! Fill your 500 ml masonary jar half with pea seeds & top with water. Let it soak for 24 hours. Empty water from the jar and rinse peas with water. Cover the bottom of your tray with about 1 ½ inches of potting soil. Water the soil so it is damp but not drenched. Cover the tray with another tray so the peas can sprout in darkness for about 5 days. Check peas daily and add a little water if needed. After about 5 days the peas sprouts will be about 3 inches high take off the tray cover and expose to sunlight for a few days. To harvest cut with sissors and use to top salads, sandwiches, pastas and more. It’s that easy! Potatoes will grow almost anywhere & when you cook them up they are bursting with vitamins and minerals. Served with their skin they are also a great source of fiber. But if you can not make the workshop you can still create your own potato sac by following this super easy recipe. Place seed potatoes in a warm sunny spot & let them form ½ inch sprouts. Place your potato sac in a sunny spot on your patio or deck. Roll down the sides of your potato sac and fill with about 6 inches of soil. Plant the seed potatoes by burying them, eyes pointed up, about 2 inches deep in the soil. Water well. Water regularly so damp not soaked. You will watch the stem of the potatoes grow above the soil. When it is about 6 inches high unroll the bag and cover with more soil so that only a few leaves poke through the dirt. As potatoes continue to grow unroll the bag and add more soil. You will know the potatoes are ready after the plant blooms flowers & the leaves start to turn yellow and die back. Then slit the sides of your potato sack and harvest lots of home grown potatoes. Keep potatoes in a cool dark area for storeage until ready to cook them up! Here are a few delicious and easy kale recipes excerpted from “The Book of Kale” by Sharon Hanna http://www.harbourpublishing.com/title/TheBookofKaleBy Sharon Hanna . If you love these recipes grab yourself a copy of Sharon’s “Book of Kale” – 100 mouth watering recipes you can create from this wonder veggie! If you can’t find pancetta substitute prosciutto, schinkenspeck or a good Italian salami, or just omit the meat. Don’t be afraid to toss in a few kale flowers! For a variation, add lightly toasted or sautéed pine nuts. You can also use this method of preparation with chopped kale leaves – preferably ones which have been kissed by frost. In a wok or heavy skillet, sauté kale buds in 1 Tbsp (15 mL) oil over medium-high heat, tossing frequently, for about 2 minutes. Remove kale from pan. Add the rest of the oil and cook the pancetta dice until almost crispy. Return the kale to the pan, add wine or water, and stir/fry 1–2 minutes more to combine flavours— kale buds should be al dente. If you prefer your veggies softer, cover the pot and steam another minute or so. Sprinkle with lemon juice, season with ground pepper and serve warm. Soba (buckwheat) noodles – these come wrapped in groups by a little piece of paper. I used one group, but you could use more (or less) if you want the soup thicker or thinner. Saute onion, garlic and ginger in a little olive oil or butter (or a combination) over low heat until onions are softened. Add kale, stirfry a little until coated with onions etc. Add tomatoes and broth, bring to a boil, reduce heat and simmer 20 to 30 minutes. For noodles – bring another pot of water to a boil. Add noodles and cook according to package directions – usually about 5 minutes. Drain and add to soup. This super easy kale dish can also be served as an appetizer, piled onto pita or crackers, or rolled in a wrap. I like to lightly roast the walnuts, but you don’t have to. Pine nuts work great with this as well. Place kale, walnuts and garlic on a board, and using a mezzaluna or a sharp knife, chop everything together until fine. Pile into a bowl and dress with the salt and lemon juice. What is easy to grow all year round in our Vancouver climate – KALE, KALE, KALE! What is more it is one of the most nutrient dense veggies you can get your hands on – boasting high levels of beta carotene, Vit C & Calcium . It can be used for juicing and in salads, stir fries, soups, dips and more. So here are some top tips on growing more kale this year. 2. When to sow your kale seeds/ transplants: You can sow your kale seeds or plant your transplants anytime in the Spring after the last frost and in September about 6 weeks before the first frost. To give your Kale seeds a head start you can also start them inside or in a green house. 3. Sowing & maintaining your kale seeds: If you are planting your seeds directly outside – dig a small trench in a sunny area of your food garden about 1/2 inch deep and pop in 1 kale seed every 16 inches. Keep well watered and if you want to give it some extra love – fertilise it with some “Kelp Man” every month. 4. 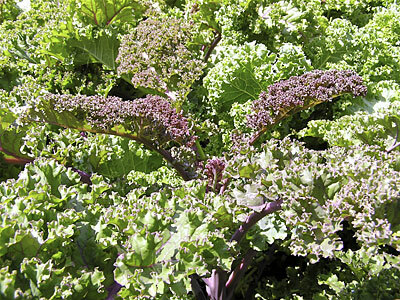 Harvesting your kale – Kale matures quickly and can be harvested in 2 months. 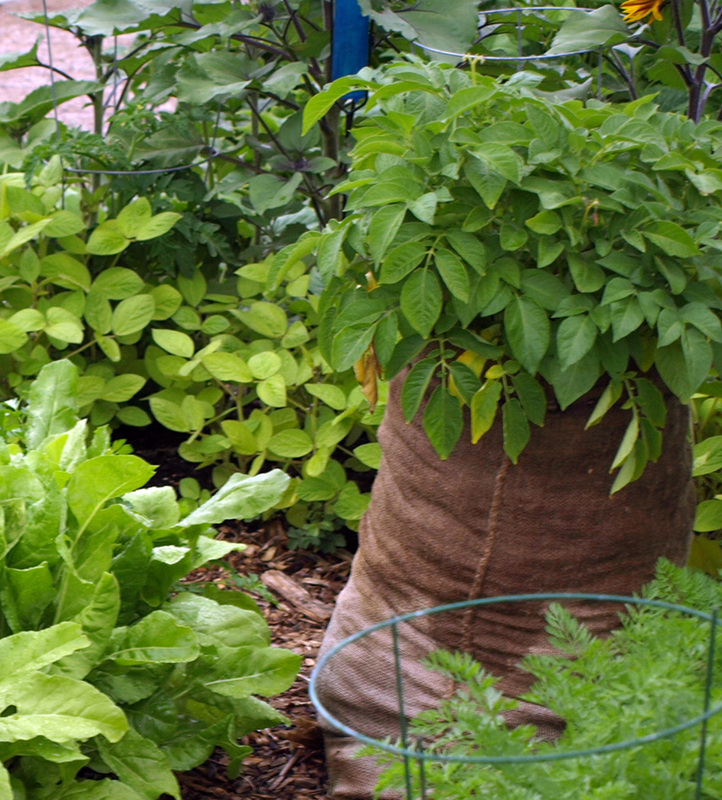 You can use the young leaves to create delicious and nutricious salads and juices. More mature kale is great for cooked greens in stir fries, soups and dips. Kale tastes sweeter after a touch of our winter frost and can be a little bitter in summer – you can create your own frost by popping it in the freezer a little. To learn more about growing kale join Sharon Hanna “kale evalgelist” at our Main Street location this Wednesday April 18th at our Main Street location 5.30 – 6.30 pm. 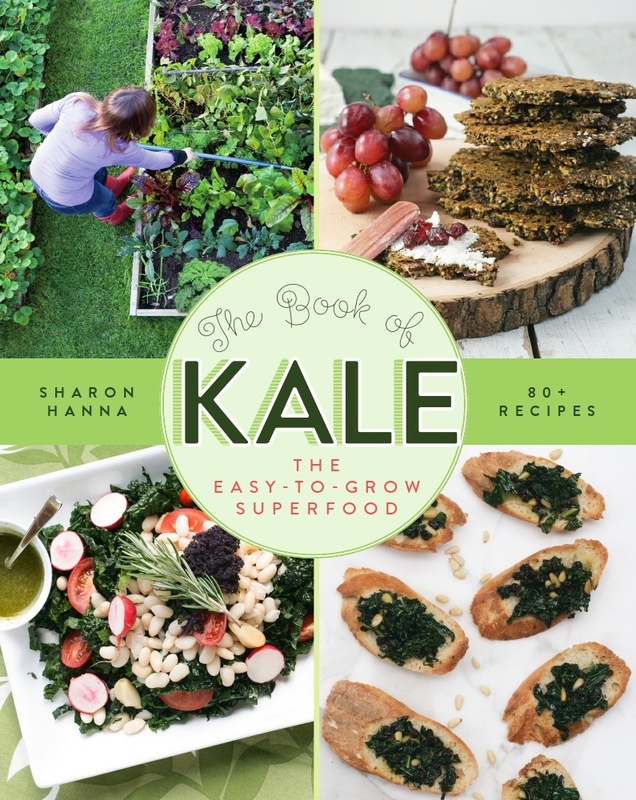 And if you can’t get there you can pick up “The Book on Kale” by Sharon Hanna – coming out in early May. So go on out and have lots of fun growing more kale! !